VRT in Belgium produce live IP transmission for music concert. 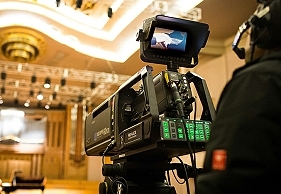 Brussels, Belgium, January 2016: The European Broadcasting Union (EBU) is pleased to announce that on 15 January 2016, the Belgium public broadcaster, VRT, successfully accomplished the trial remote production of a live musical concert using IP and open standards across the whole production chain, thereby demonstrating the capabilities and benefits of IP in live broadcast production. The remote production set-up was an extension of the full IP local studio set up that was previously demonstrated by the LiveIP project group. The concert venue (Bozar, in the centre of Brussels) was connected to the LiveIP control room (at VRT Brussels) by one single 10 km long optical fibre cable, carrying an IP network, much in the same way as the local studio of the LiveIP project is connected to the same control room. It took only 1 hour to set up the equipment at the concert venue, and the feedback from the VRT production team was overwhelmingly positive. “The combination of CWDM technology and IP for broadcast allows us to transport approximatively 25 Gbit/s for all 4 IP cameras, 10 microphones, intercom, telepresence and controls over one optical fibre cable, without any delay. This made our remote production so easy and transparent that you immediately forget that your program is being produced 10 km away from the stage upon which it takes place!” Said Karel DeBondt, Project Manager at VRT. “Most noticeable was the huge time-saving on the setup of the production. You basically connect your optical fibre and you’re good to go: video, audio, intercom, controls and internet are instantly available.” He added. The LiveIP Project, part of the VRT Sandbox technology accelerator programme, is the world’s first proof of concept of a complete multivendor live production chain that relies exclusively on IP. Driven by the VRT and the EBU and powered by a long list of partners, including Axon, Dwesam, D&MS, EVS, Genelec, Grass Valley, Lawo, LSB, Nevion, Tektronix and Trilogy, this venture has developed a fully functional IP production studio. The Project also uses existing open standards, including SMPTE 2022-6, AES67 and PTP. As a result, it demonstrates a high level of interoperability. LiveIP presents the industry an opportunity to learn in a real-life scenario – to test assumptions and demonstrate value. The group’s effort helps ensure future investments and provides much needed leadership to the industry through the IP transition.